February 27: More than one influential person has been quoted saying “National Parks are the best idea America ever had,” and after the days we spend in one, we are often left saying the same thing. While visiting them is not our only focus in adventuring, they are found on our things to do list when we are near one. 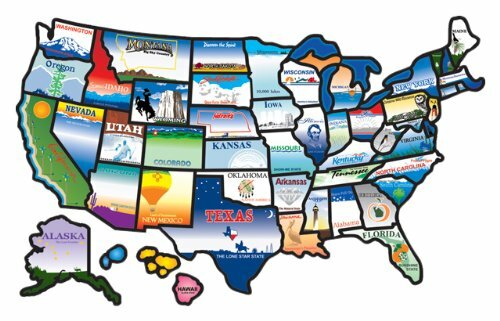 Whether a National Park, Monument, Seashore, Historic Site, etc - we like to check them out. Our preference in exploring the parks is to spend a whole season nearby and really get to explore all the park has to offer as we did with Acadia National Park rather than a quick visit to simply say we have been there. 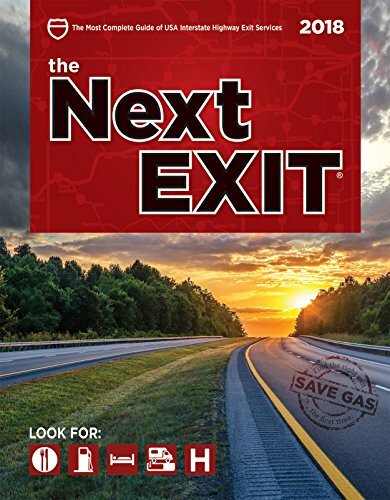 When we only had one day to spend at Everglades National Park and Carlsbad Caverns National Park, we were left with a desire to go back and explore more, which we will likely do in the future. That is why you don’t see many of the big and bold National Parks are our list yet, as to truly experience it, we plan to spend a season there and the opportunity to do that hasn’t arisen yet. The National Park Service has 419 sites and parks under their jurisdiction covering 85 million acres. 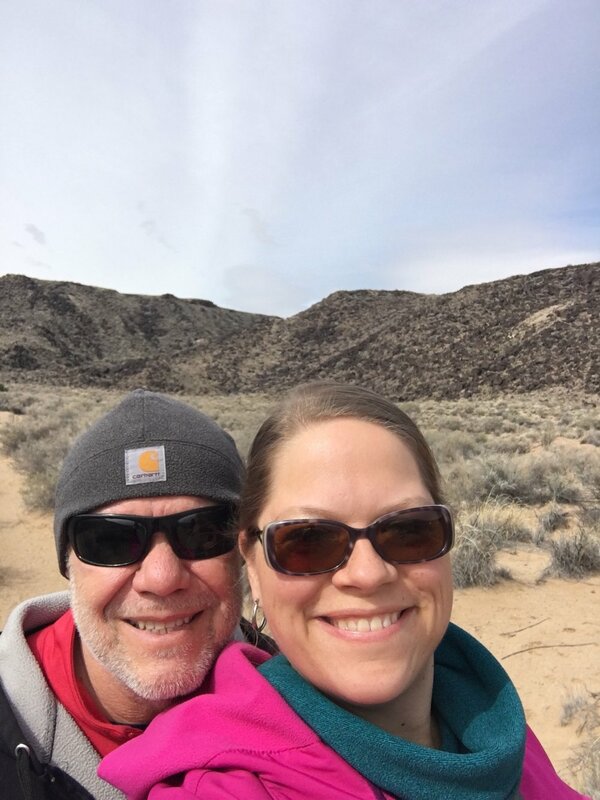 We haven’t even hit 10% of them, so we still have lots to enjoy and we notched another one into our belts with Petroglyph National Monument located right here in Albuquerque. 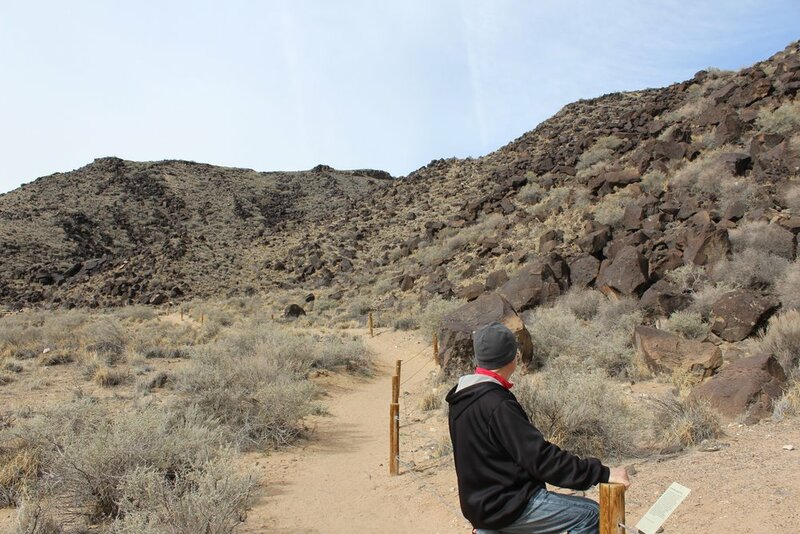 We navigated across the city to Petroglyph National Monument. As we approached we couldn’t help by notice its contrast to many other National Parks Services sites by its proximity to urban life, with residential houses and busy roads serving as the parks’ next door neighbors. Considering the deep history of the park makes this a unique combination where past meets present. Having done our research, we knew that the address we were navigating to was the park’s visitor center where we would get some information about the park and snag a map which would guide us to other locations to search out some petroglyphs which are the parks namesake. As the website and many signs at the visitor center detail - if you are an Uber rider, make sure your driver doesn’t simply drop you at the visitor center as there are no hiking trails or petroglyphs that can be sited from this location. After some helpful information from the park staff, a quick video with some background information and a map in hand, we headed toward one of the three petroglyph viewing trails. Our trail of choice was the Rinconada Canyon trail which was a 2.2 mile loop with the potential to spot up to 300 petroglyphs. Less than 2 miles from the visitor center was a nice parking area with restrooms and new picnic tables, which we later utilized for a picnic lunch. After a quick bathroom break, we started along the dirt trail in search of the promised petroglyphs. So, what is a petroglyph? Why are they here? What do they mean? Petroglyphs are a form of rock art. These drawings were created by carving or etching into the surface of the rock. So who did the etching and why? They are believed to be created by the region’s earliest inhabitants starting with the American Indians, likely the Pueblo, Apache and Navajo people, who lived nearby or were passing through about 300 to 700 years ago. More recently, but still 200 to 300 years ago, Spanish explorers and settlers etched their own images into many of the same rock formations. The meaning of these ancient drawings etched into the rock surfaces using tools such as chisels and hammers is thought to be varied. Many were to represent sacred beliefs, others to symbolize certain tribes, some were to serve as trail markers or provide direction. Historians have been able to decode the meaning of many of these drawings pecked into stone, but some remain a mystery. 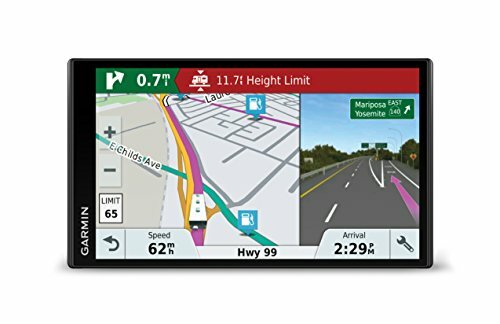 We kept comparing them to modern day road signs, Instagram photos showing local terrain or to a Facebook post to communicate with others in your tribe. While others don’t hold such a public meaning and many Native people believe the true meaning of these images should not be shared as they are truly personal and have deep cultural and religious significance. Others say you will only be able to spot the petroglyphs if you are meant to see them. Archaeologists have estimated that the Petroglyph National Monument grounds are home to over 20,000 petroglyphs. While you will likely spot them anywhere you hike in New Mexico, it is important to have a place dedicated to preserving these ancient etchings. 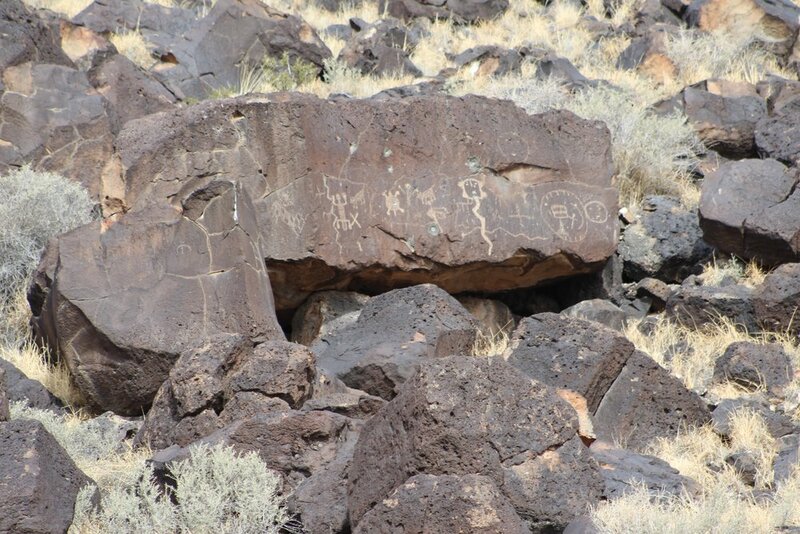 For us, they provided a valuable record of cultural expression and still hold spiritual significance to the descendants of the Native Americans and Spanish settlers that designed the petroglyphs. Before hitting the trails, we learned quite a bit about the the lay of the land through the 20-minute video at the visitor center. It was there we learned about how the 17 miles of escarpment were formed where these petroglyphs were spotted along the trail. Isn’t escarpment a cool word, one I was happy to be able to include in a blog post. An escarpment is a long, steep slope that separates areas of land at different heights. It was caused by six volcanic eruptions, about 200,000 years ago. As the lava flowed it gave birth to an extensive mesa, an isolated flat-topped hill with these steep sides that form the jagged, boulder-strewn escarpment. This part of Albuquerque is known as the West Mesa. This same area is also part of the Rio Grande Rift which was created when the crest of the Colorado Plateau pulled away from the crest of the Great Plains forming a giant crack where the earth’s crust dropped down creating a large trough that is forty miles wide in the Albuquerque area. On the east side you will find the Sandia Mountains and located in the center of this rift is the Rio Grande River and Petroglyph National Monument. The area that surrounded this rift was unstable making it subject to many earthquakes, creating deep cracks where magma would erupt. The lava that flowed in this area, cooled and hardened becoming basalt rock. 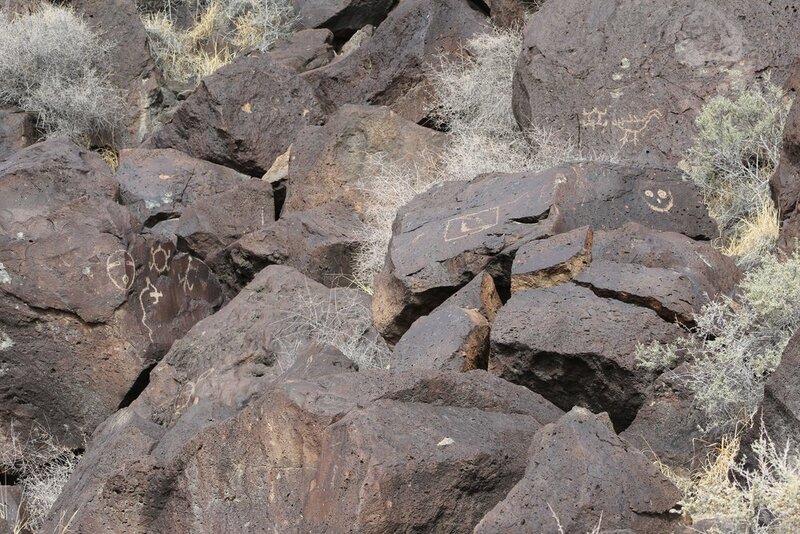 It is the nature of the basalt rock that allows the petroglyphs to be so visible. Basalt is a light gray color, but being a combination of iron, manganese and calcium when exposed to oxygen and water it rusts, creating a dark, shiny patina often called a desert varnish. The petroglyphs were formed by chipping off the dark varnish layer to expose the lighter basalt rock which makes them stand out and be visible even after hundreds of years. 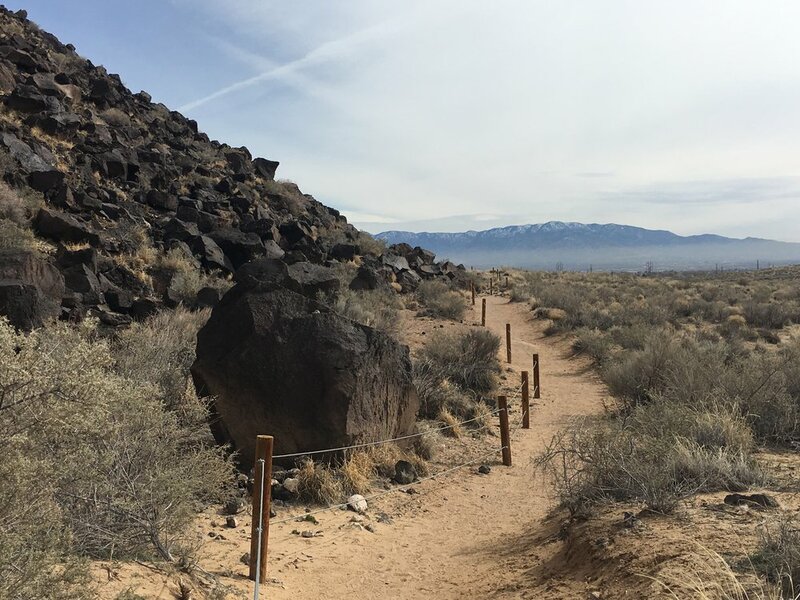 Also a part of Petroglyph National Monument is the Volcanoes Day Use area where you will find three now-extinct volcanic cones. These are known locally as the Albuquerque Volcanoes or the Three Sisters. There are three trails in the area that take you close to the cones without damaging the topography. This landscape is sacred to the Native Americans and they believe that hiking to the top violates this sanctity. We did not explore these trails, but will likely check them out before leaving the area. On our daily commute, we can spot the three volcanic cones jutting out of the flat mesa in the distance. As we made the turn in the looped route, the return trail gave us a good perspective of the rock escarpment from a distance. 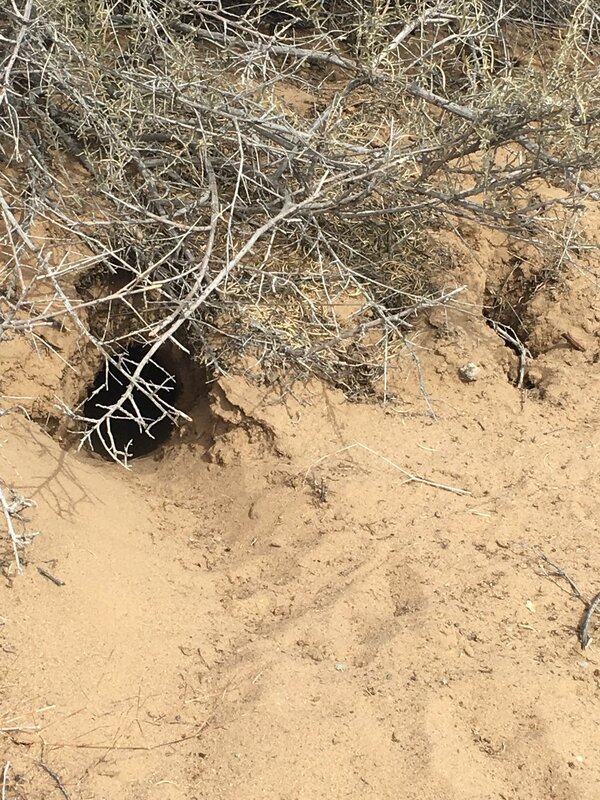 It was here that we spotted what looked like lots of snake dens, likely the home of rattlesnakes. While it was nice and sunny, it was still pretty chilly, so likely the snakes were sitting around the fire toasting marshmallows waiting for the arrival of the warm spring days and hot summer months. Two other Petroglyph viewing trails are recommended on the park map provided at the Visitor Center as well as the National Parks Service website. The Boca Negra Canyon has three short paths that are partially paved and provide the opportunity to see up to 100 petroglyphs. The other trail is the Piedras Maracas Canyon as a 1.5 mile roundtrip hike with nearly 400 petroglyphs along the way. This is listed as the easy, most level trail with a sandy surface. 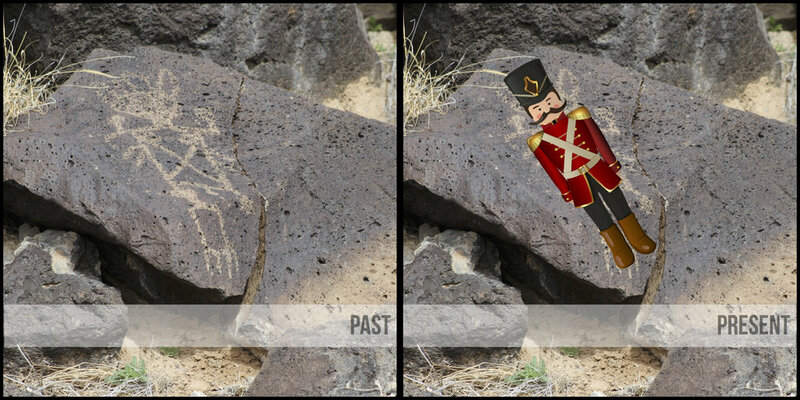 Visiting Petroglyph National Monument is like taking a trip back through time. We kind of felt like we were on a treasure hunt, spotting Native American and Early Spanish Settlers artwork. Some may think they are just carvings in the rock, but even with this jaded attitude, most will fall for the fun of pointing out a another cluster of glyphs. While we viewed the petroglyphs, we often did not know the meaning of the carved image or symbol, but found ourselves in awe of the ancient sacred landscape. We celebrated their existence and respected their importance to the decedents still living in the area today. If you visit, please do you part in preserving the petroglyphs, by staying on the trails and not touching them in anyway. With that said, we couldn’t help but compare them to current things in our lives. We spent lots of time pondering the shapes and found ourselves giggling at what they could have meant or what the looked like to us. These petroglyphs tell the stories of those that came before us. While we may have not come across the same meaning as those who carved them, it is our hope that our enjoyment of the petroglyphs would have brought them joy. Go Take A Hike -- okay, yes please!